"How Would YOU Feel ..."
How would you claim your copyrighted property? Do you realize you do HAVE copyright protection? Most folks don't understand copyright protection and ownership because they believe all works must be registered with the U.S. Copyright Office in order to be considered protected. In reality, it is advisable to copyright your work through the Copyright Office, but it is NOT REQUIRED in order to establish ownership over the work itself. Nevertheless, you should be prepared and ready to act swiftly when (not "if") your copyrights are abused! You can also learn every detail about protecting your copyrights BEFORE they are stolen. Everything is much easier if you have followed simple directions for protecting your intellectual property in the first place. It DOES take more than a few legal documents posted on your site, but the process is still quite easy! You just have to know what that process is! "State of the World Wide Web"
But, this is about iCop.™ Members of iCop™ displayed a seal on their web sites showing they were members of our professional organization. I spent many hours over the years tracking down, and dealing with, thieves who believed they could simply pirate that seal and put it on their own web sites - without our authorization. The goal of iCop™ was to honor those online business owners who use the highest degree of professionalism and business ethics. We had a better than excellent reputation in that our members displayed exactly those qualities. However, sometimes I wonder if it's possible for any organization to make a dent in cleaning up the internet. So many scams - so many "business owners" who have no intention of treating their customers with anything other than contempt - so much BS ... And, so much theft! I am constantly asked to help folks who have had their intellectual property stolen - and used - online! I know they do need help. I'll admit - it literally took me YEARS of trial and error to learn how to handle this successfully! "This Can - and Probably WILL - Happen to YOU! In just a short period of time, I have known three online business owners who have had their web sites stolen! Their entire web sites - good GRIEF! Unfortunately, the theft itself is only the beginning of the problem. One victim was advised by several people to, "just leave it alone ... let it go." In a pig's wazoo! For one thing - why do we bother to put a copyright mark on our work if it isn't going to mean anything? For another - she could soon find her own products stolen right along with the site design. 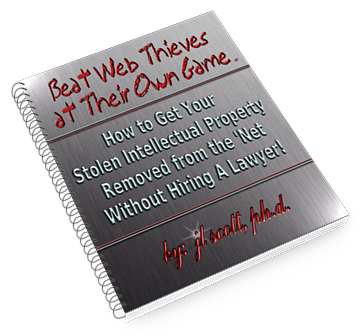 If your intellectual property is stolen - you need to get that stolen material OFF the Web! In one of the instances mentioned above, the product WAS actually stolen - right along with the entire web site - and was being sold by the thief. He even used the same credit card processor as the real owner! In this case, you would not only need to get your product back into your possession, you would need to put this guy out of business! In addition to all this, the thief then proceeded to market the product using "spam." Is this something you should just "leave alone?" I don't think so! A thief is a thief is a thief. This person isn't going to have an ounce of ethics. You can bet you're dealing with someone whose reputation will soon be in the toilet. Do you want your property associated with this? Believe me, sooner or later, it WILL rub off on YOU! In this case, the thief's web host REFUSED to ban the stolen site. Even with undeniable evidence that the owner had both his domain name and his site up first! Even though the thief had been reported for "spam" by an outside source! What do to next? You Need to Know How to FORCE that Web Host to Cooperate! Even when the web host cooperates, the job isn't finished. In fact, your job starts before something is stolen. And, it takes more - a whole lot more - than simply posting the proper legal documents on your web site! I'll guarantee you - thieves don't read those documents! It, also, isn't over just because one web host shuts the pirate down. He could simply get a new web host and put it all back up. Now granted, getting rid of this guy can take some work, energy and stamina on the part of the victim. But, let it go? Well, I suppose you could. But, how much are your web site - your products - and your reputation - worth to you? They're worth a lot, I'm sure! But, can you afford an attorney to deal with this for you? If you can - and if you want to hire an attorney - great! But, it isn't necessary! Remember, I dealt with this on nearly a monthly basis when thieves pirated the iCop™ Seal. The job always got done to my satisfaction, and I have yet to hire an attorney to do it for me! I've become an expert at dealing with online thieves! "Beat Web Thieves at Their Own Game!" It takes more than a few legal documents. Yes - those documents on your web site are important. But to enforce those documents, you must either hire an attorney or know the complete process for taking down a thief. It involves knowing specific steps to take, in what order to take them, knowing where to find what you need, knowing who to contact and the process and time for contacting them. It involves knowing just as much about copyright law as you need to write the proper communications. In this publication, I will take you by the hand and show you - step-by-step - with exact information and links. I give you extremely detailed and 1-2-3 directions for getting YOUR property removed from a thief's web site. Write every detail you need to notify - via email - the alleged thief he has been caught: exact sample provided so you can "fill in the blanks"
"Going a Little Bonkers, Here?" I imagine you are! It's a lot of information to put into action! It can happen to you! Work online long enough, and it undoubtedly will. The trick is to be prepared. Don't wait until you find your intellectual property being used and abused by someone else. Keep this report handy so you can move fast when the time arrives. When the time comes you need this information, you most likely won't remember where you saw it - even if you bookmark it! If this report should be unavailable, you will spend months - a lot of trial and error - and even more grief than you already have with copyrighted property - trying to get the process right. Otherwise, you may as well make a gift of your property to the thief! Beat Web Thieves at Their Own Game gives you every piece of that information in the most minute detail. You are left with nothing to guess. If you DO have a question, I will donate my time to answer it for you, via email, at no additional cost to you! Right now, I am advertising this ONLY to the readers of The Online Business Trade Journal™ and my blog. You are "my people" and YOU get the discount. In fact, the discount amounts to over 27% OFF what others pay for the same product! "So, Now the Big Questions ..."
Are you willing to spend just $27 for a detailed process that allows you to legally have your intellectual property removed from the web site of a thief? Are you willing to be "up" on that process, and have it in hand, when you need it? This $27 price is a very special price. That isn't a drop in the bucket compared to what you would pay an attorney to get your copyrighted material removed from the Web. In fact, it is about 10% of what a lawyer will charge you for ONE CONSULTATION! The rest of the legal fees will be for actually doing the work. And, that's IF you're lucky enough to find an attorney who only charges $270 per hour! Not hardly likely! Truth is ... You don't need an attorney. I did this process constantly in retrieving the iCop™ Seal. I know how it works! I seriously doubt anyone (other then the lawyers) has done it more times - successfully - than I have! And, I have written every detail of my exact process. Get it while the price is so low. You could need it any day! It's best to have it on hand - so you can move quickly - when the time comes. Meanwhile you will have - and will be using - the exact details on how to protect your copyrights BEFORE they are stolen! If you don't believe this information is worth $27, just ask for a refund. I'll give it to you in a flash! Don't wait another moment! Order Now to get this ridiculously low price! P.S. After your purchase of Beat Web Thieves at Their Own Game, you will receive ALL future editions, and any new or addditional information absolutely FREE! P.P.S. REMEMBER: If you DO have a question, I will donate my time to answer it for you, via email, at no additional cost to you!